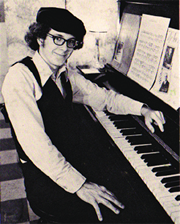 Born in 1958, George Foley started playing ragtime at the age of 13. He received most of his musical education at the Cleveland Music School Settlement, where he studied piano, theory, composition and jazz improvisation. George attend the College of Wooster in Wooster Ohio, where he hosted a weekly ragtime radio show and payed piano for the Wooster Jazz Ensemble. He was awarded the Charles V. Rychlik Composition Award by the Cleveland Music School Settlement for his "Chinatown Rag" in 1974. He released his first album "Cleveland Rag" on Century-Advent Records in 1977. It was re-issued on the Jazzology label in 1980.